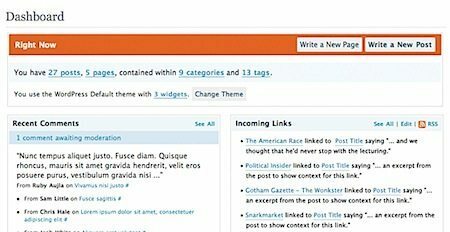 WordPress version 2.5 comes with some major changes in the look and navigation of the dashboard. While everything, and more, is still in the dashboard some things have to be renamed and getting to them is a little different now. As you can see the WordPress 2.5 dashboard has some major visual and menu navigation changes. While it is less cluttered my only issue with it (so far) is all my step-by-step guides are now outdated. This personal dilemma is a two edge sword: My old guides are outdated but now I have a source to write more guides and posts. If I can find the time. Finding the main Dashboard link is the first thing that has moved to the very top left corner, is very small and hard to see. Presentation is now Design – Clicking the design menu will show the same submenu for Widgets and the theme editor. Options are now Settings and are over on the far right in a smaller hard to see text. The Blogroll is now named Links and you can put them into categories that will show separately on the sidebar in their own category. I especially like this as it can be used as site navigation for sites running entirely on WordPress. Some of the nice additions to WordPress version 2.5 are a new Media Library to manage your media files, as well as more than ten available text widgets. The Widgets menu has also got a major face lift and will be one of the first guides I do in following posts on WordPress version 2.5. I still stand by my thought that if your WordPress blog is running fine and you are happy with it then you may not want to upgrade to WordPress version 2.5. Some bugs will still need to be worked out and theme compatibility may be an issue for you. Plugins, however, are the main concern if you have a certain plugin you must have then your best to research it to see if there is an updated version or any compatibility issues.